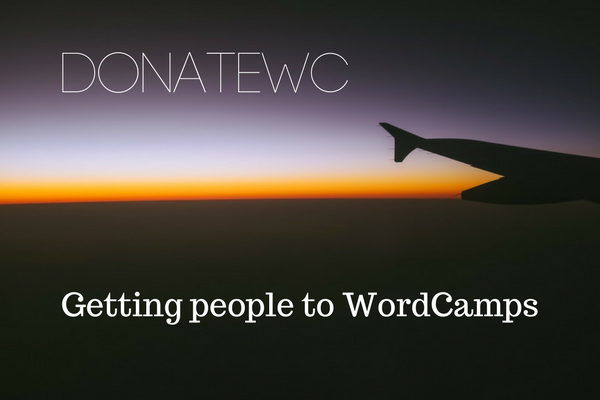 If you are a WordCamp or WordPress meetup organizer, there are a couple of things you can do to help spread the word about DonateWC. Please note that this document is incomplete and that your input is greatly appreciated! You can make an announcement during your event – you can either mention the donatewc.org website or ask people to consider making a donation. You can share information about DonateWC on your website/blog. You’re welcome to use this image to support your message. You can give a shoutout on social media – doesn’t have to be anything consistent (although we’d appreciate it). One shout out to your local community can help propel us forward. You can help make this a success! It’s your community, and you’re already doing an amazing thing by helping to share knowledge and inviting interested parties. Keep it going, make a mention of this initiative! We’d love to see what shout outs you’ve done, or retweet/reshare your message. You can either send us an email or tweet to us about it.